It’s Monday. A new week. When I was first invited to join JCL last year as an observer after expressing an interest in getting more involved in social justice, I must admit part of me questioned if there wasn’t something more important I could be doing. Sure, reading to young kids is a good and nice thing to do, but shouldn’t I be delivering bikes at Cradles to Crayons or collecting food for food pantries and families in need? The JCL middle school students fill the bus with boisterous chatter and laughter as we eat our lunches and head to the Curran Early Childhood Education Center in Dedham. The Rashi students’ youthful exuberance highlights the contrast between their being kids and the mature assignment they were about to carry out. Childish giggles fade and as we enter our kindergarten buddies’ classroom a focused calm spreads. 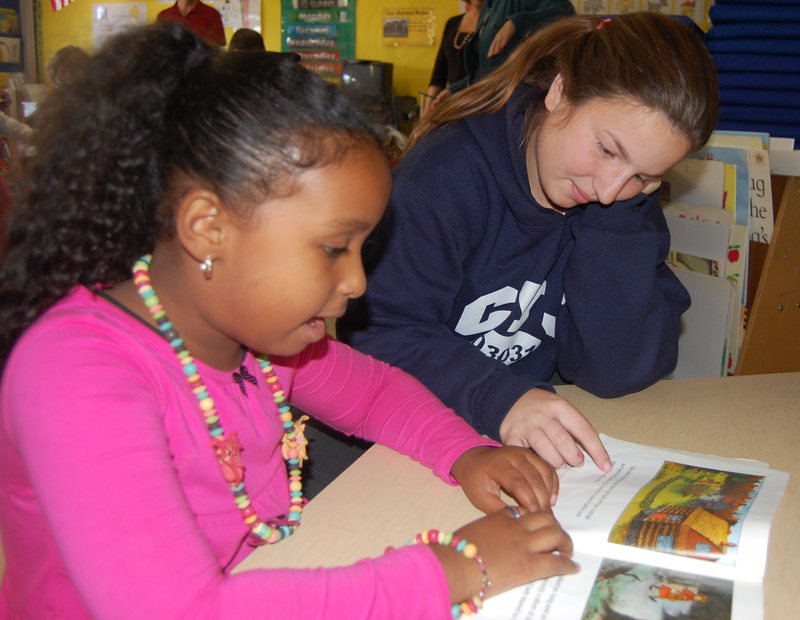 As each middle school student pairs up with a kindergarten buddy, it is evident not only that expectations are clear, but that the Rashi students are all personally invested in the connection with their buddies and in the work they came here to do. I am in awe but can’t seem to put my finger on precisely why. Something is happening here that is much more than simply reading books to kids. Slowly I start to get it. Every middle school student LOOKS different to me from how they look at Rashi. The pressure of external evaluation dissipates as they are doing their best because they want to; because the alternative is not an option for them. On the bus ride back to Rashi we debrief. Students share thoughtful stories of successes and challenges, questions about how to address a difficulty that arose with a particular student, and exchange ideas about possible perspectives to consider and solutions to attempt. I begin to realize that this is, perhaps, the most important social justice work I could ever hope to be involved with. Educating. Opening doors. Stretching horizons. Changing freedom from to freedom to. I’m in. I’m sold. I make my commitment and join on a permanent basis. Looking back, I can hardly see where we all began as we’ve all come such a long way individually and together. Kindergarteners who were painfully shy or didn’t speak English or didn’t know their letters are proudly speaking out loud. Middle school students who struggle to regulate their focus in class are modeling proper focus to their younger buddies and guiding them thoughtfully and patiently. Kindergarteners who never read books at home are asking their parents to get them books and read with them. Young teens who typically only get excited about unstructured time with friends or the latest Justin Bieber song are excitedly sharing their success stories with the group in sharing time and on the bus. “My buddy read the whole book TO ME!” “My buddy made connections between the book we read and his own life experiences!” My eyes light up with theirs and my heart soars. To me, this is one of the meanings Hannah Senesh spoke about when she asserted, “blessed is the match” and it fills me with joy to see that instead of being consumed in the kindling flames, our students and our kindergarten friends are fueled and blessed with a bright, bright future.